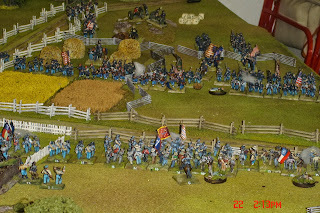 This summer in a moment of madness and opportunism I bought two ACW armies off Paul Stevenson. 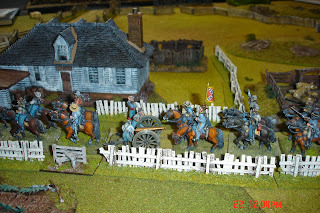 He was shifting the Redoubt Miniatures part of his collection. Painted, based, lots of them and a bargain too! 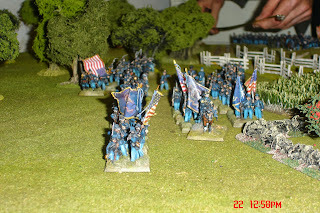 John came up this week for a game and as it'll be my last at home for a few weeks subject to the after effects of my operation next week, we decided to givethe ACW troops a baptism of fire in their new home. The scenario was a simple one. 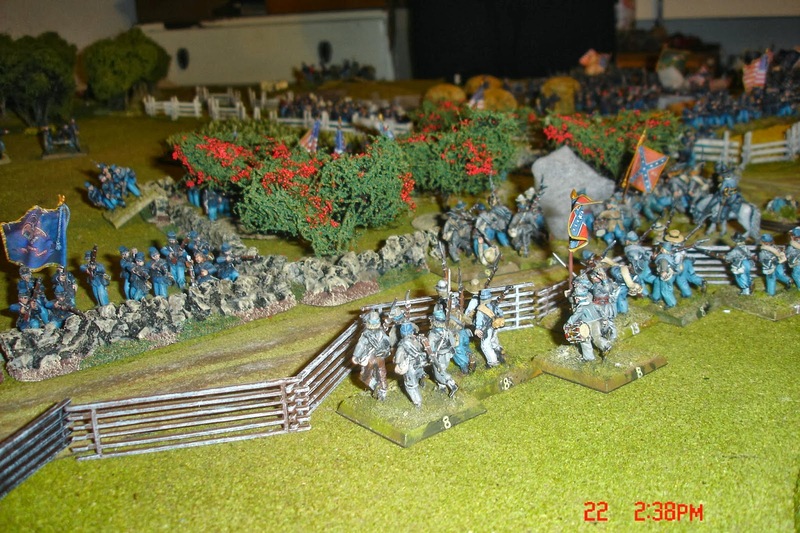 Both sides had a brigade of cavalry and three of infantry. 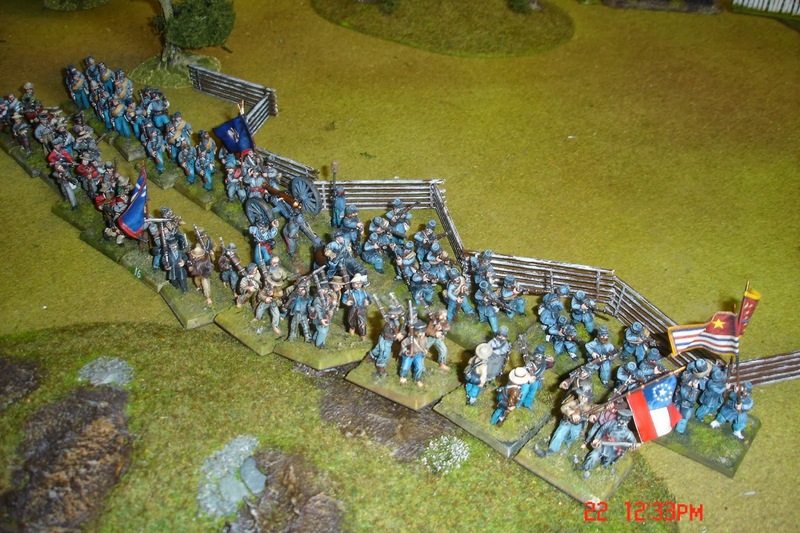 The Confederates had 3 regiments of cavalry and ten of infantry with 4 guns while the Federals had 2 units of cavalry and 12 of infantry. Four of the Federal infantry units were classed as 'large', but they were also 'newly raised' which in Black Powder means that you don't quite know how they will perform when first in contact with the enemy. 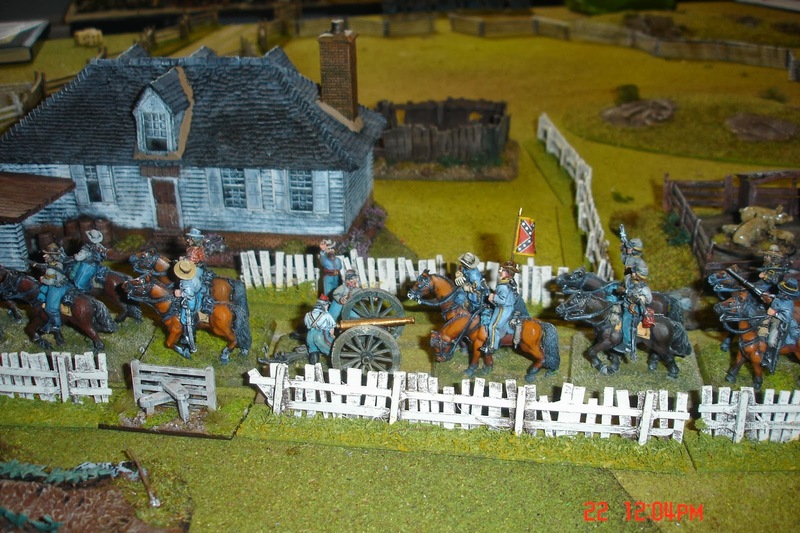 The Federals were supported by 5 batteries. 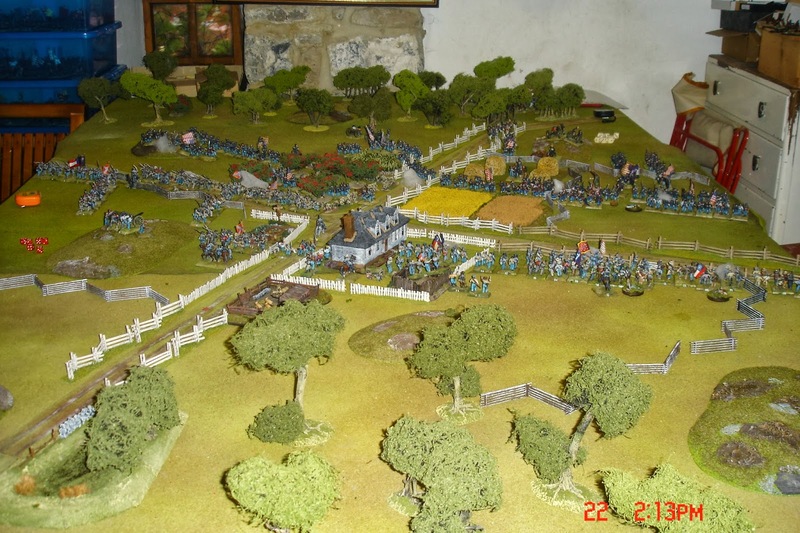 Both armies' objective was the vital crossroads in the centre of the table, and they entered from opposite corners. 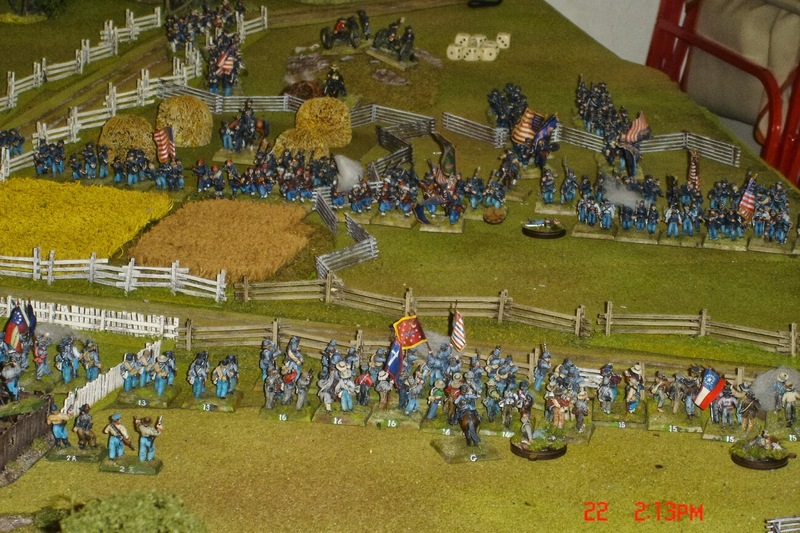 Both sides forces would be preceded by their cavalry followed by at least one brigade of infantry in turn 1. 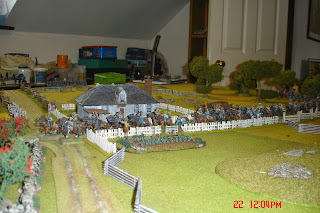 I got to go first and threw low for my cavalry so we made it right up to the crossroads with one regiment while a second, supported by their artillery, occupied the building and surrounding area. 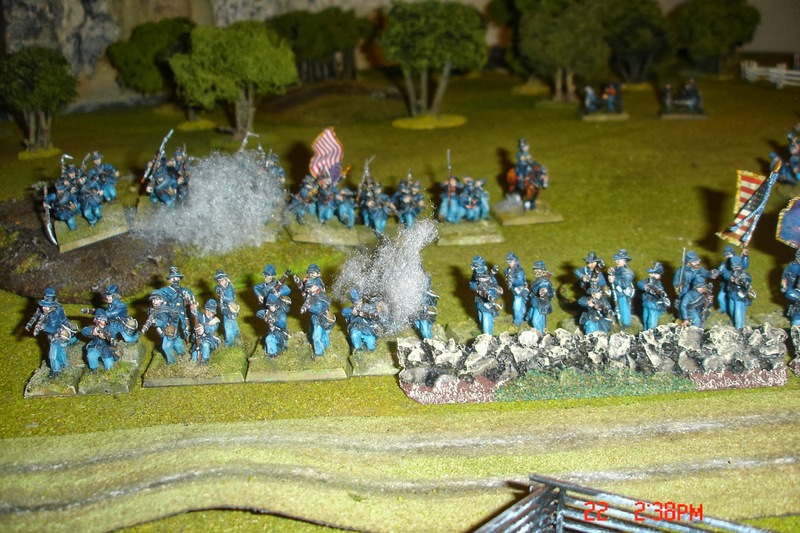 The third regiment moved up in support. 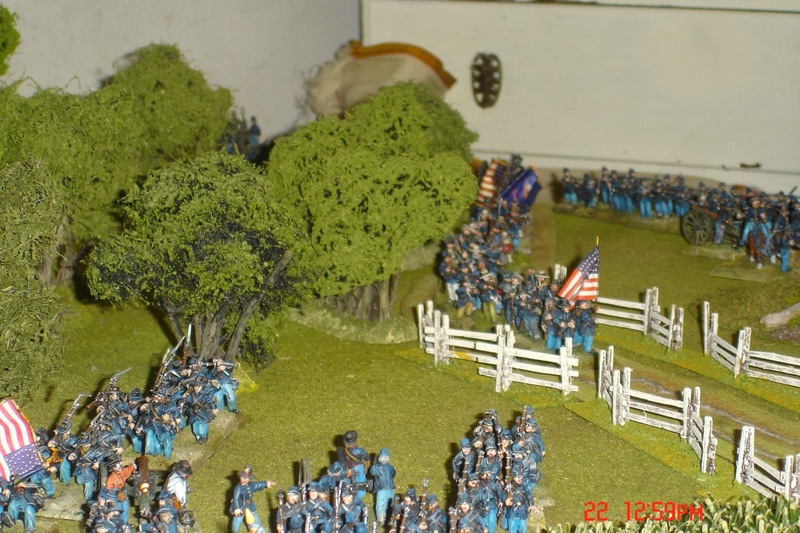 My first infantry brigade headed off through the woods on my right to try and get to the road before the Federals. John started by throwing a blunder! 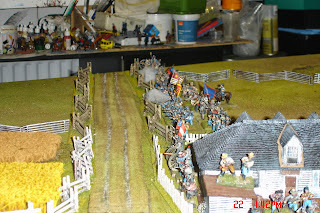 His cavalry belted off straight ahead up the road and almost crashed into mine. 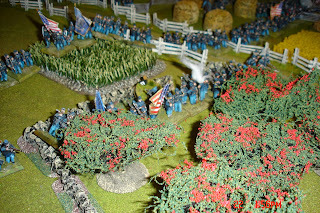 His next command roll for the infantry following them up was also a blunder! 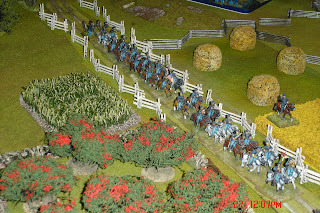 They headed off in more or less the right direction, through the woods. 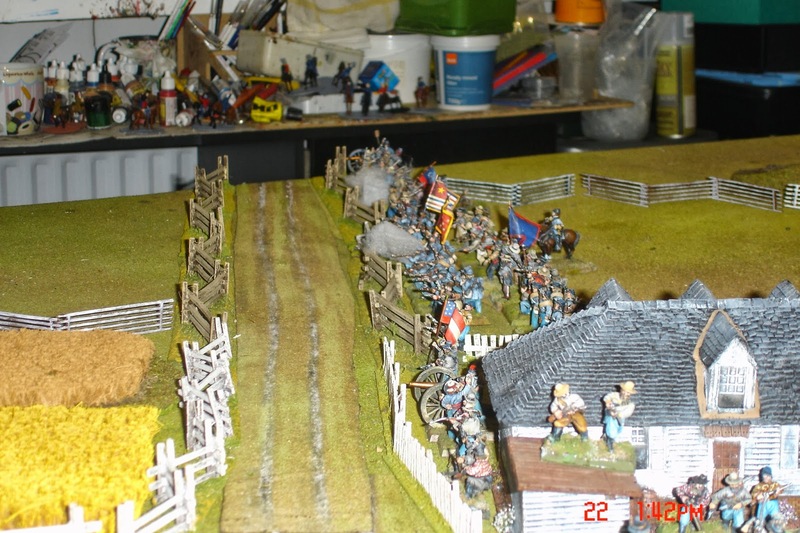 His next brigade managed to get on the table but there was one hell of a traffic jam developing! 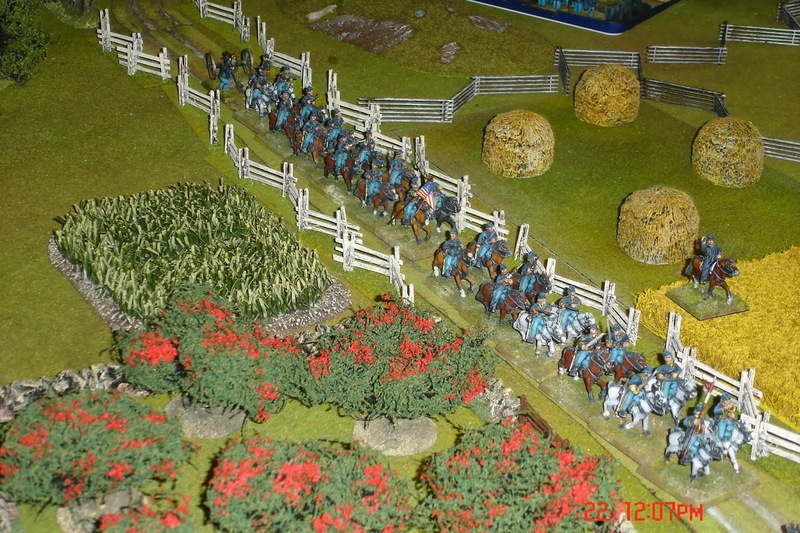 My cavalry shook out into line and shot up the Federal horsemen, disordering them in the process. 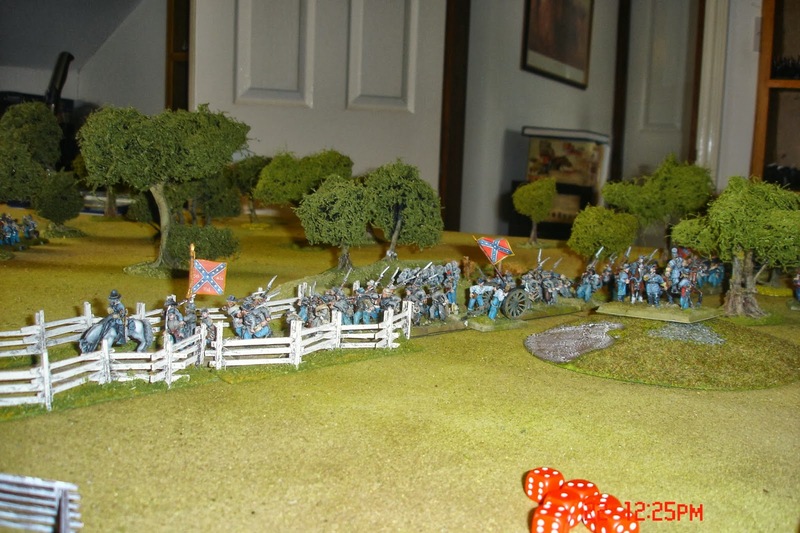 The Confederates then occupied the cherry orchard and moved their supporting cavalry up, to catch the Federals from the front and in the flank and disorder them again. The other Federal cavalry advanced and dismounted in the cornfields, and were trading fire with the Rebs in the buildings. 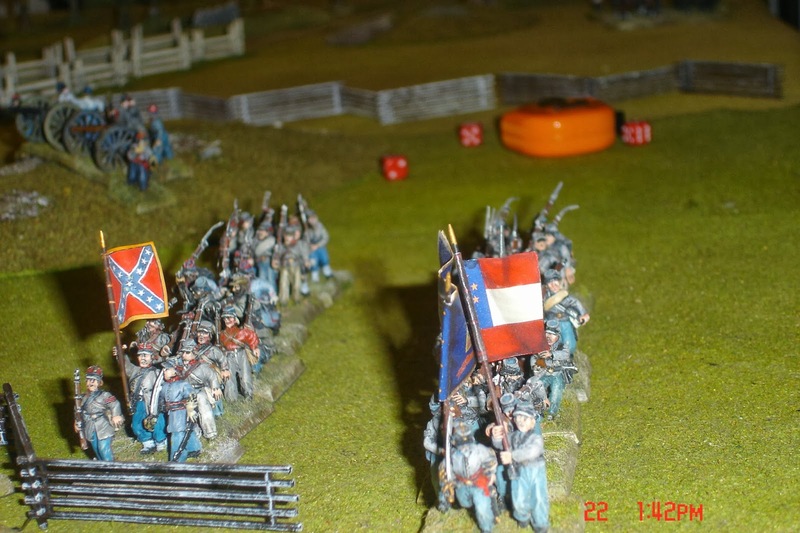 Federal infantry were advancing in long columns, and the remaining Confederates were also on the table and making steady progress towards the enemy. 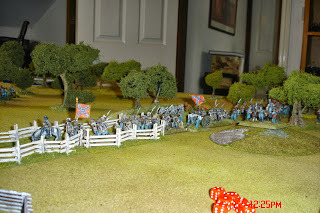 My brigade on the right made slow work of occupying the fence line on the road but managed to eventually without much hindrance from the Federals as John was throwing some miserable command dice which stopped him deploying fast and take advantage of his superior numbers. The Federal cavalry brigade was eventually driven off as both units were shaken, leaving a nice hole for Johns infantry to plug. 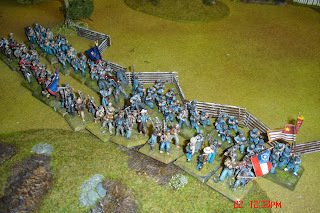 On the left my infantry made slow progress but did manage to form some sort of rather exposed line along the fence line. 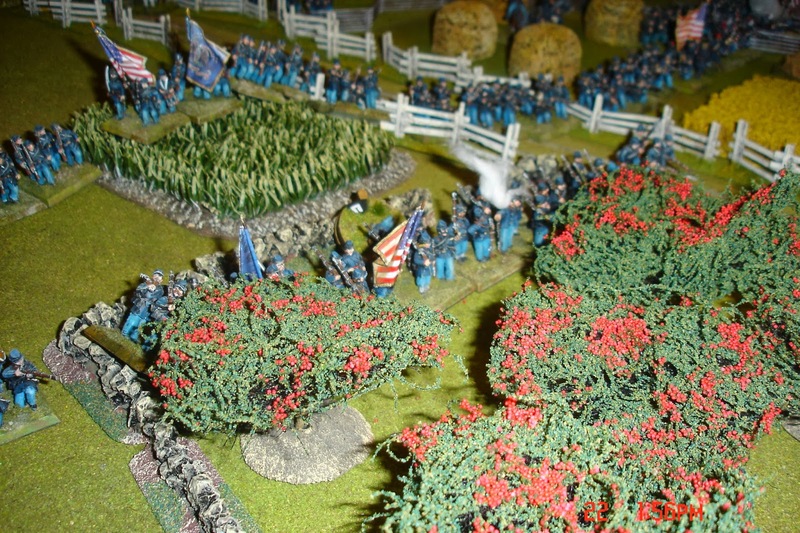 The dismounted cavalry in the orchard were driven off and broken by Federal infantry. 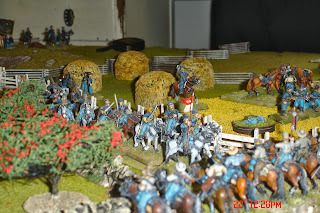 One of John's regiments on my left was exposed and not well supported so I threw common sense to the wind and charged it with one of my units. Another managed to throw a low command score and moved around its flank and deployed into line. I survived the closing fire. 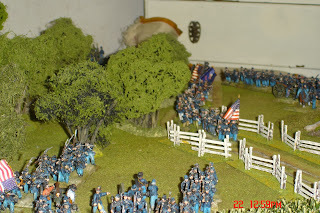 But in the melee, although I killed 3 of the Federals, I missed ALL my saves and lost 5 in return, thereby loosing the melee. I failed my break test and ran. Both supporting units had to take break tests, and both also failed and broke. So in less a few minutes my whole left flank was up in the air! Thankfully, John's brigade facing them was badly cut up with half it's units shaken. On the right we spent most of the game exchanging long range fire and neither side was able to close as we were being very efficient at disordering each other. 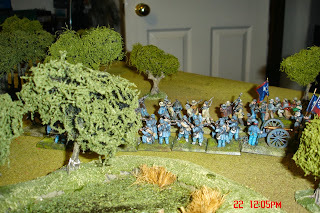 I lost a gun which was left exposed when I tried to withdraw my dismounted cavalry and replace them with an infantry regiment who failed to move up into the line. John's two brigades on my right were getting badly shot up, disordered and one unit in each was shaken. I was winning the fire fight (just!) 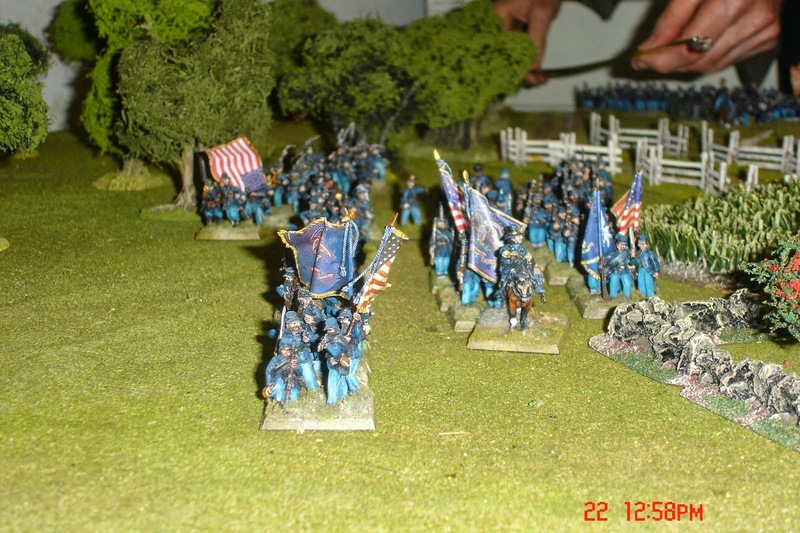 but the Federal reserves pushed through and renewed the fight with fresh troops. At this point we had to call it a day. We were both within one brigade of our respective army break points, although I felt that my position would be untenable if we'd played another couple of moves. 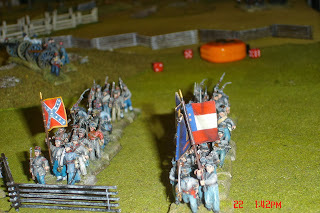 As it was it was agreed we had fought each other to a draw, although the Confederates would in truth have struggled to hold the superior Federal numbers at bay if we'd gone on much longer, although there was a reasonable chance that the Federals may have had more troops shaken in the process. We will never know. A Fine looking game and an interesting view of BP too. Hope the operation goes well! Hope your feeling better. Entertaining report. Fantastic looking terrain!